Joyce Chen opened her first restaurant in Cambridge, Massachusetts in 1958. She found that the selection and quality of Chinese cookware in America didn't live up to her high standards… so she developed her own. Today, Joyce Chen Products sources from all over the Pacific Rim to bring the best of Asia to you. 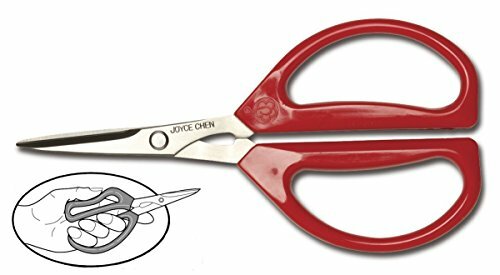 This original "Unlimited" scissor is used and recommended by professional chefs and food stylists. The patented design features a short jaw which increases force near the joint adding tremendous strength to the cut. 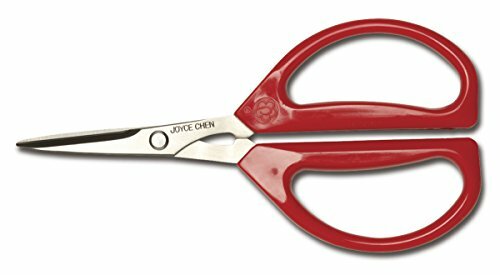 These are not “just scissors”. With unique Japanese alloy metal for the blades, they’re extremely strong and useful throughout the house. It is dishwasher safe, with soft, flexible red handles and powerful precision cutting. Its ingenious design is for right or left-handed use. Perfect for use in the kitchen, in craft projects, and many other applications. If you have any questions about this product by Joyce Chen, contact us by completing and submitting the form below. If you are looking for a specif part number, please include it with your message.